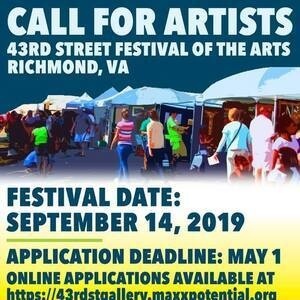 Call for Artists for the 28th annual 43rd Street Festival of the Arts. This year, the event is Saturday, September 14th, 2019, 10 am to 5 pm. This event is limited to 80 regional artisans and features some of the finest arts and crafts available in the area. It is a great way for artists to show and sell their work to an appreciative audience. A unique selection of contemporary art, fantastic music, great food and a loyal crowd help round out the event. Online submissions only. Applications available and posted on Facebook at 43rd Street Festival of the Arts and online at www.43rdstgallery.com/festival.